“Were women ordained as deacons? I believe yes. Can women be ordained as deacons? I believe yes,” she said. Zagano is one of 12 people, including six women and six men, appointed to the commission, the Vatican announced Tuesday. If the church someday comes to the decision to ordain women deacons, Zagano said, she envisions it playing out differently across the globe. Zagano said local needs and customs would have to inform any decision about women deacons. “I don’t think that as an American I can speak for all cultures,” she said. Reacting to the pope’s announcement Tuesday, Chicago’s Archbishop Blase Cupich said in a statement that he welcomed the news, and he made a call for the church to place women in leadership roles. A group advocating for women priests also praised the news. 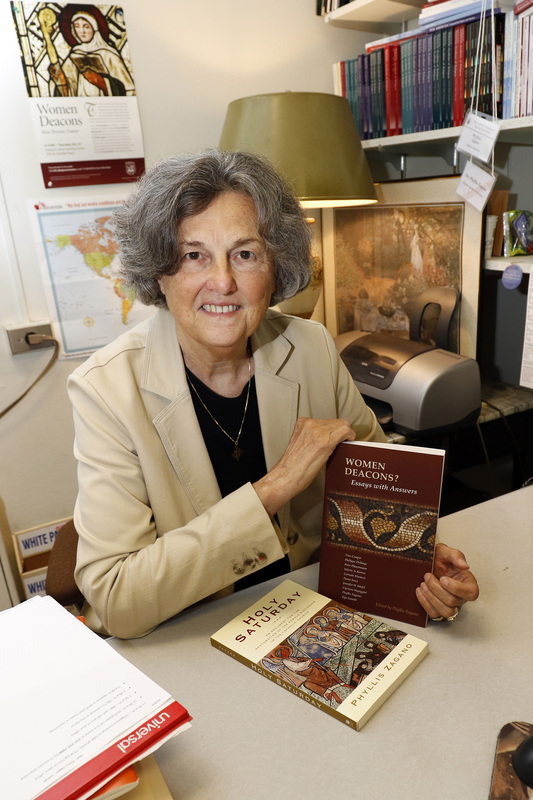 Back in May, Pope Francis announced that he supported the idea of establishing a commission to investigate if women had ever served as ordained deacons or merely as assistants in the early church. But the pope later said he was “angry” at media reports that suggested he was opening the diaconate to women, rather than offering support to study a particular historical question. Catholic scholars of varying stripes tend to agree that women did serve in some sort of deacon-like role in the early church. The controversial question, however, is whether women leaders were ordained or if they assisted ordained priests and deacons. Those who support the notion of women deacons frame the argument as readmitting women to the diaconate rather than expanding the ministry to include women. On the other side, those opposed say that deacons today are understood to be part of the church’s ordained ministry—a role that is thus closed to women. Deacons had been part of the early church’s leadership structure for centuries, but the role had largely faded away sometime around the fifth century. Men studying to be priests were still ordained as deacons during the following years but only provisionally on their pathway to the priesthood. Following Vatican II, however, the church restored the ministry of permanent deacons. There are about 15,000 active in the United States today. This won’t be the first time the Vatican has studied the possibility of women deacons in recent decades. In 2002, the International Theological Commission wrapped up a decade long study that included the question of women deacons. Father Georges Cottier, the head of that commission, said at the time that while the group came to no definitive position, it generally felt women had not served in a sacramental role in the early church. But the commission hedged on whether or not women could be part of the modern diaconate. I hope the church does not limit itself to the historical role of women. The role of women was never fully developed. I hope the church asks the question, "What does the church need for women to do?" and develop the role in response to the need. This would foster a broader and more appropriate role for women. When “launching out into the deep” on things theological, I always make it clear, I’m not a theologian, just someone given to theological speculation. That understood, I respectfully venture on. We accept God’s Gift that, the whole Church is priestly and Diaconal too, because all the Baptized are called to offer priestly sacrifice in some way, “My Sacrifice and yours” the ordained priest says at Mass, and to serve, “service” being the principal function of the Deaconate. Within that frame our Mother of Perpetual Help, blessed Mary, from day one offered with her Son, as we all do, “His Sacrifice and hers.” And at the Annunciation showing blessed Mary’s Diaconal connection, I venture to say, that her words to the Angel, “I am the handmaid of the Lord,” understanding that handmaids are servants, could accurately translate as, “I am the Deacon of the Lord.” Therein I suggest rests the validity of women Deacons. This does not mean that ordination to the priesthood is also a Baptismal entitlement of women and all men and the best reason I can think to validate that assertion is, “because the Church says so,” linked to Jesus’ words to Peter, “Whatever you bound on earth, is bound in heaven …”. However, at one point in history, Bishops in Southern Sicily did ordain women as priests, until it was stopped by Pope Gelatius I. Interestingly, during WW II in Eastern Europe the Faithful in the Underground Church there ardently desiring the Holy Eucharist, with no Bishop, or priest available, on its own authority called forth some men from their Assembly, who confected Eucharist and along with men also some women. Subsequently, after The War that situation was studies by Rome, where the ordination of men to the priesthood by acclamation was upheld by Pope Pius XII, who also declared “invalid” the ordination of the women. This is what I was told years ago and unless disproven, I believe it. Allow another speculative consideration on women as Deacons. I don’t know if the following practice ever existed at the diocesan seminary level, but it did exist in monastic seminaries, certainly among Capuchin Franciscans, who, at completion of the Third Year of Theology, were ordained to the priesthood in the Simplex Mode. These student priests at the completion of the Fourth and final year of Theology were given what is called “Faculties” that is, permission to exercise their priesthood fully in hearing and absolving sin in Sacramental Confession, whereas, in the Simplex Mode that permission was withheld, although in dire necessity Simplex Priests could hear Sacrament Confession absolving from sin, as they were fully priests. As a young man in Detroit I served the Masses of a Simplex Priest, Fr. Solanus Casey, OFM Cap., now as Venerable Solanus Casey on the road to Beatification. Although as far as it is known Fr. Solanus never heard a Sacramental Confession, thousands of the Faithful flocked to him for spiritual help and healing. All were healed spiritually and some healed physically. A truly holy and humble priest of God. It’s said that God raises up Saints in the Church to model a particular need that may come to exist. The question comes to mind, “Why would God raise up a Simplex Priest as model of holiness in His Church without some specific purpose?” Could the purpose be to model a life dedicated to ecclesial service in a specific way as was entirely Fr. Solanus’s vocation? Modeling through service, the entire Deaconate, men and perhaps women, Deacons ordained as it were in the Simplex Mode to serve, an Ordination declared by the Church to be Holy Orders in the Simplex Mode. A thought. Now let me conclude as my post has become much longer than intended. May the Gentle Spirit Dove guide the Church to Understanding exactly what God wills for our Church in these times. Lisa, it would be good to.be open to the guidance of the Holy Spirit than to simply cling to tradition.